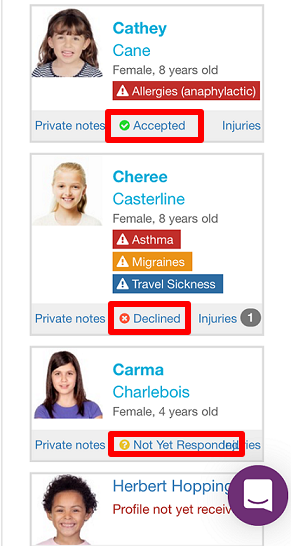 This article will guide Staff Members on how to check eForm responses using the CareMonkey mobile application. 1. Log in to the CareMonkey mobile application (see this article for instructions). 2. Scroll down to the Groups and eForms section, and click the eForm name to view the profiles. 3. At the bottom of the profile, it will show the status of the Profile Owner's response to the eForm. Click on the link for Accepted or Declined to view the Profile Owner's answers to the eForm questions.